Prepare to be charmed by the lively atmosphere and spirits of the Olde Country. 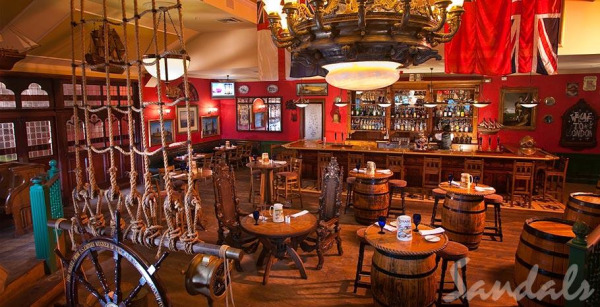 Admire the authentic décor that makes up Sandals entertaining British pubs including bars with brass railing, carved ceilings and solid wood floors. Some of the watering holes were even brought piece-by-piece from the motherland. 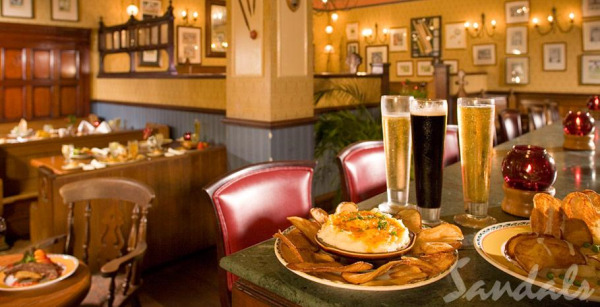 Known for tasty grub and good times, these taverns offer traditional pub fare including savory Shepherd's Pie and crispy Fish 'n Chips. Always lively, Wobbly Peacock, Cricketer's, Drunken Duck and Olde London Pub serve a diverse selection of premium brand drinks, imported beers and drafts. 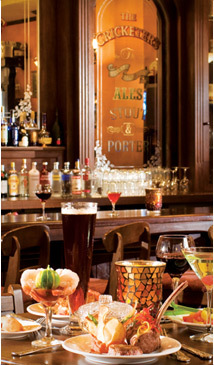 Olde London Pub (Sandals Grande St. Lucian, St. Lucia) pays homage to world famous British pubs. 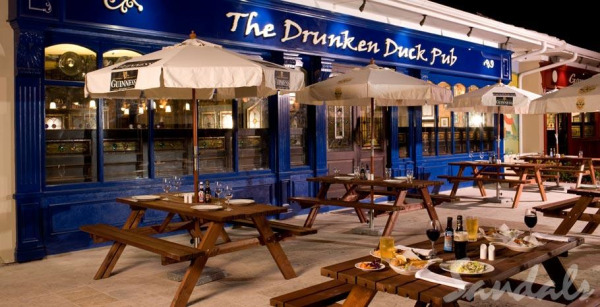 Down a pint of draft beer as you tuck into British gastro-pub fare. With traditional decor like antique mirrors, clipper-ship wall paper and carved bar with brass railings sent over, piece-by-piece, from an actual old London pub, you'll feel as if you've ventured across the Atlantic and entered into another reality completely. The Cricketer's Pub (Sandals Royal Bahamian, Nassau, Bahamas) Take a tour of England's finest pubs from the warmth of the Caribbean. 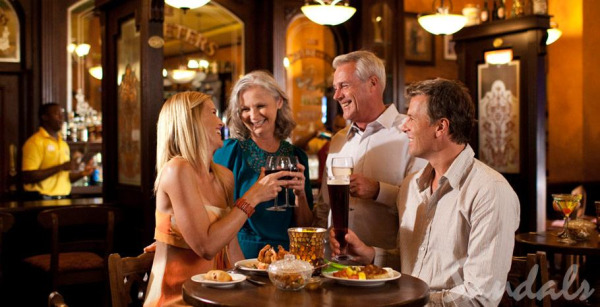 Enjoy old favorites such as shepherd's pie, bangers and mash smothered in rich gravy, and other traditional pub food in a jovial British atmosphere. Tap your feet to the music as you enjoy a "sweet" and wash it all down with a pint or two late into the night. Whether you are planning a Caribbean honeymoon, destination wedding, 25th wedding anniversary or you're just a beach-loving foodie, let me help you select the right Sandals resort for your vacation style. There is never any charge for my services. Click below to request your one-on-one vacation consultation or register to attend our next Sandals webinar.